The cost-effective option for thickening municipal and other flocculating sludge by gravity. The Alfa Laval AS-H Belt Thickener efficiently and cost effectively reduces the volume of municipal and other flocculating sludge to produce dry thickened sludge. Key benefits include reduced energy use and polymer consumption, combined with minimal need for operator attention and maintenance. The trouble-free operation thus gives important reductions in both cost and hassle for the plant management. The simple design of the Belt Thickener offers numerous advantages for water removal in all types of flocculated sludge. A patented sludge/polymer mixing valve uses a unique method for injecting and mixing the polymer to ensure optimum turbulent blending. After this, the patented ramp feeding section delivers a consistent load across the filtration area to maximise filtration properties. The result is excellent thickening in a totally-enclosed, low-odour unit. Numerous maintenance challenges are eliminated via a robust design which includes a simplified belt tensioning and alignment system that is free of complicated hydraulics. Fatigue and wearing problems associated with rotation of large components are also avoided. The design allows easy access for operators to view the process. The reliable Belt Thickener has a small footprint and is suitable for both indoor and outdoor installation. How does the gravity belt thickener work? 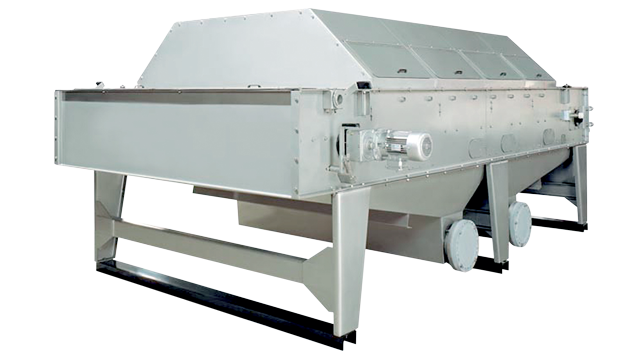 The sludge thickener works on the principle of separating liquid from solids by gravity drainage through a slowly rolling belt cloth. It uses a sludge polymer mixing valve with an adjustable lever arm to ensure sufficient turbulent sludge/polymer mixing. After this, the ramp feeding section delivers a consistent load across the filtration area to maximize filtration properties. A sludge retention tank, also known as the ﬂocculation chamber, is filled from the bottom and then rises up over a weir to ensure even distribution onto the belt. Sludge ploughs force the sludge into lanes, which allows free water to run through the belt cloth where sludge is not present, thus enhancing the pre-dewatering process. Sludge ploughs can be lifted to allow for removal of rags etc. The result is excellent thickening in a totally-enclosed, low-odour unit.